Image by slagheap via FlickrDecember 26, 2004---One of the worst natural disasters in recorded history hits Southeast Asia, when the strongest earthquake in 40 years hits the entire Indian Ocean region. The massive 9.3 magnitude earthquake, epicentered just off the west coast of the Indonesian island of Sumatra, generates enormous tsunami waves that crash into the coastal areas of a number of nations including Thailand, India, Sri Lanka, the Maldives, Malaysia, Myanmar, Bangladesh, and Indonesia. 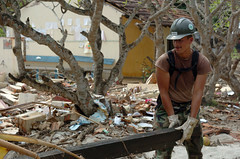 The official death toll in the affected countries stands at 186,983 while more than 40,000 people are still missing.